(CNN) – Fans around the world were distraught when “Downton Abbey” ended its sixth and final season. Aunt Violet, Carson, Lady Mary, Spratt and others left a sizeable hole when author Julian Fellowes decided that Christmas 1925 would signify their swansong. Arguably the most famous character in the show is still going strong, however: Downton Abbey itself, in real-life Highclere Castle, 70 miles west of London in the English county of Hampshire. Home to the earl and countess of Carnarvon, the main house was remodeled by Charles Barry in 1838 to become the imposing building now known to millions. It’s only open to the public 70 days a year, with tickets proving hugely popular, but special events and parties also allow guests to experience the house and grounds first hand. Tutankhamun tomb: Highclere was home to the man who found it. One of the most remarkable periods in Highclere’s history came a century ago. Alongside archeologist Howard Carter, the then Lord Carnarvon discovered the tomb of Tutankhamun in 1922. However, uncovering the boy pharaoh King Tut’s resting place in Egypt’s Valley of the Kings was to prove the source of a legendary curse. Lord Carnarvon died two months later in Cairo from an infected mosquito bite. It was said that at the precise moment of the tomb being opened, his favorite dog back home at Highclere howled and died on the spot, while more than 20 people associated with the excavation allegedly died in mysterious circumstances. One thing is for sure, the antiquities collection and Egyptian exhibition at Highclere offer an illuminating look at this fascinating history. “Downton Abbey” was full of romantic liaisons, both in public and behind closed doors. Tragedies and war may have prevented Matthew and Lady Mary, Daisy and William, and Tom and Lady Sybil from finding long-term happiness, but Anna and Mr. Bates were one of the couples who did live happily ever after. Those wanting to channel some of that romantic mojo can stay the night at Highclere in London Lodge, dating from 1793, or on one of the estate’s cottages. The accommodation books out well in advance. An English summer’s day wouldn’t be complete without afternoon tea and, naturally, Highclere offers one in its renovated Coach House. Smoked salmon, egg and cucumber sandwiches are all on the menu along with scones with clotted cream and no fewer than three types of cake. Adjacent is the Highclere gift shop where visitors can stock up on all manner of merchandise they didn’t realize they needed. Perhaps a pair of coffee mugs with “his lordship” and ‘her ladyship” on them, or a packet of wildflower seeds from the grounds. Talking of grounds, Highclere’s gardens were designed by the legendary 18th-century landscaper Lancelot “Capability” Brown. Known as “England’s greatest gardener,” with more than 170 to his name across the country, 2016 marks 300 years since his birth. Part of his renown lay in his ability to carefully locate individual and groups in such a way that they framed views and perspectives. 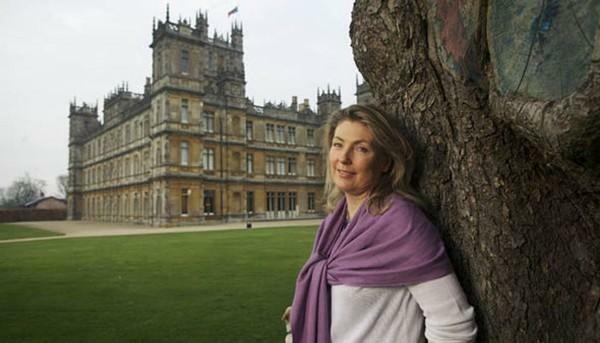 Spring 2017 sees the publication of the latest book by the present Lady Carnarvon, delving into entertaining and food at Highclere. Any fan of “Downton” knows that eating — and more importantly drinking — seems to happen on an almost hourly basis throughout the day. “At Home at Highclere Castle: Stories and Menus from the real Downton Abbey” looks back at four historic weekends in 1866, 1886, 1895 and finally 1935, featuring a cast of genuine VIP visitors such as the Prince of Wales and revealing how Highclere would entertain them. Expect recipes and menus to reveal some of the real Mrs. Patmore’s secrets. There are no shortage of four-legged creatures for visitors to spot at Highclere, with stables of horses and countless sheep dotting the grounds, while muntjac and red deer also roam the woodlands of the estate. However it’s dogs who really take center stage at Highclere. In real life Lady Carnarvon has no less than seven Labradors, while on screen Lord Grantham’s faithful canine companion was famously a Labrador called Isis. Actor Hugh Bonneville chose the name himself on set as the Labrador in the first series was called Pharaoh and he wanted a name similarly related to Egyptology, for which Highclere and Lord Carnarvon were famous. Any rumors of a link to a far more infamous ISIS were, therefore, completely unfounded. A Christmas 2018 release has already been talked of, so fans may yet get the big screen encore they’ve been waiting for.